It is the high-mountainous valley located in riverheads of Big Zelenchuk. 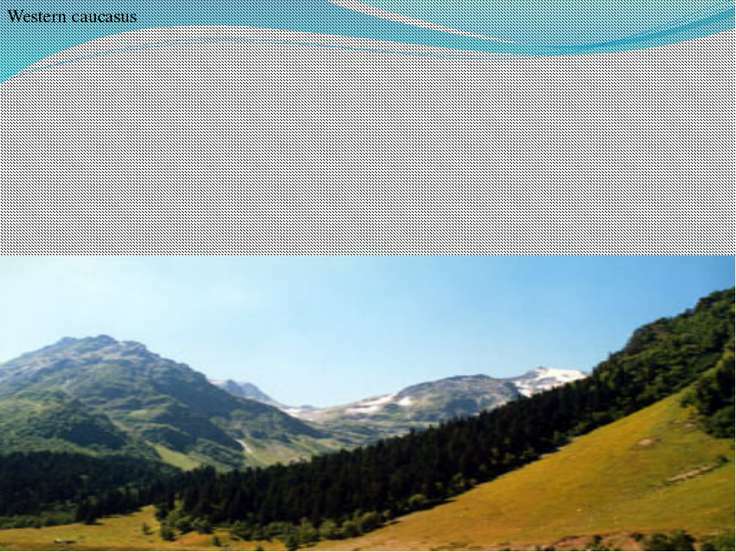 In woody mountains of the Western caucasus the fan of gorges leaves to a snow ridge of the Main Caucasian ridge. 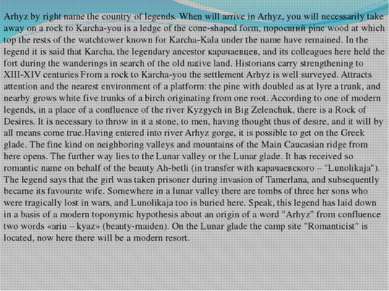 Arhyze , the soft climate settles down in an original mountain bowl, here, there are no strong winds. From four hundred high-mountainous lakes Karachaevo-Circassia, about seventy lakes are in Arhyze. Majestic fir and pine woods, fill settlement with aroma of needles. On the sun of a pine seem golden and give to settlement special charm. Here oak groves adjoin to a pine pine forest. Direct and smooth trunks of pines lift the shaggy heads almost on 30-meter height, behind the glades decorated with rare birches, firs and fur-trees darken. Here there are firs семисотлетнего the age, reaching 70-85 - meter height and having diameter in one and a half-two meter. 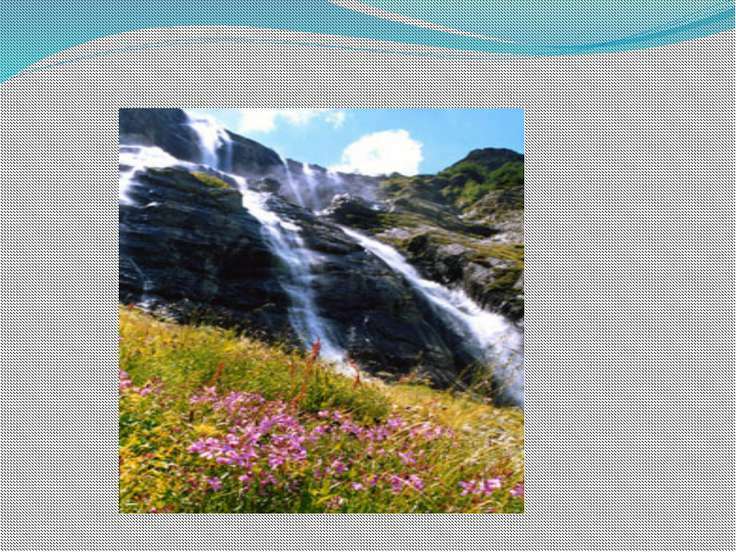 A fir help to weaken power of avalanches and селей, rockfalls and collapses, protects soil. Old fur-trees are entangled by freakish threads of a lichen, sparkles, on the sun a web with drops of the damp dew as if you are in fantastic wood. Elegant fly agarics adjoin with modest маслятами. Steppe plants grow mixed up with mountain plants. Bumblebees and bees buzz, strange butterflies fly over blossoming meadows, on a stone the lizard has hidden, in bushes has run ежиха with the kids-ezhatami. The transparent stream running among an emerald grass, reddening fragrant wild strawberry and originated of glaciers a number of a standing ridge rings, with cheerful noise and a rainbow of splashes it flows down falls on ledges on a mossy channel. And through trees in a becoming blue distance the mountain tops covered with eternal snow shine. 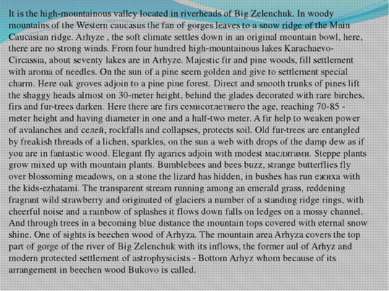 One of sights is beechen wood of Arhyza. 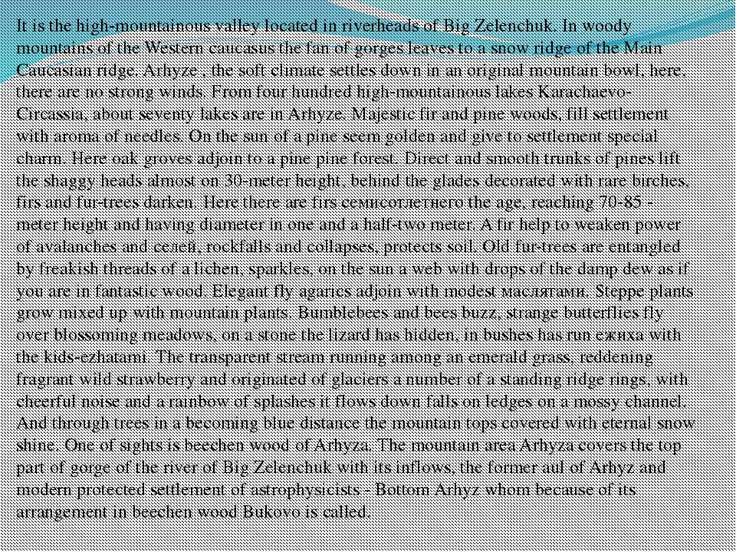 The mountain area Arhyza covers the top part of gorge of the river of Big Zelenchuk with its inflows, the former aul of Arhyz and modern protected settlement of astrophysicists - Bottom Arhyz whom because of its arrangement in beechen wood Bukovo is called. In the Russian history of Arhyz and its ancient capital Maas is link of times, communication between Byzantium and Russia. Here there are first Christian temples in territory of Russia. In one place the Byzantian churches dated of 9-10 centuries and a rock drawing of the Face of the Christ, monastery construction are located. Absolutely nearby from the most ancient site of ancient settlement and road, to a look one more picturesque road to small town of astronauts of Bukovo, curling a streamer among rocks and surprisingly picturesque ferns, raspberry thickets on mountain Pastuhova (1401) comes off. Here in 1972 the Big telescope azimuthal (БТА) – an optical reflector with a six-meter mirror has been put into operation. 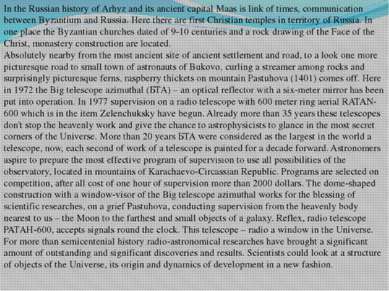 In 1977 supervision on a radio telescope with 600 meter ring aerial RATAN-600 which is in the item Zelenchuksky have begun. Already more than 35 years these telescopes don't stop the heavenly work and give the chance to astrophysicists to glance in the most secret corners of the Universe. More than 20 years БТА were considered as the largest in the world a telescope, now, each second of work of a telescope is painted for a decade forward. Astronomers aspire to prepare the most effective program of supervision to use all possibilities of the observatory, located in mountains of Karachaevo-Circassian Republic. Programs are selected on competition, after all cost of one hour of supervision more than 2000 dollars. 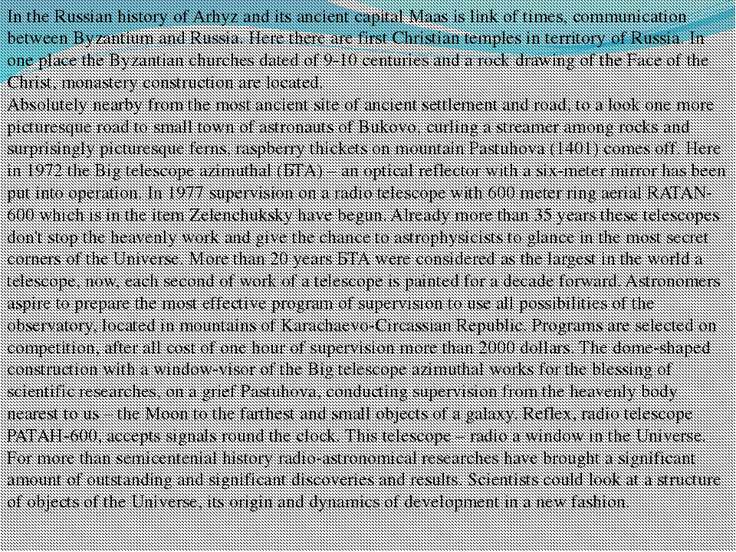 The dome-shaped construction with a window-visor of the Big telescope azimuthal works for the blessing of scientific researches, on a grief Pastuhova, conducting supervision from the heavenly body nearest to us – the Moon to the farthest and small objects of a galaxy. Reflex, radio telescope РАТАН-600, accepts signals round the clock. This telescope – radio a window in the Universe. For more than semicentenial history radio-astronomical researches have brought a significant amount of outstanding and significant discoveries and results. Scientists could look at a structure of objects of the Universe, its origin and dynamics of development in a new fashion. Arhyaz it is known for a mountain medical climate. A climate here is moderate-continental. It tones up a human body. In different parts of area, thanks to big crossed territories, the climate is distinguished. In the bottom northern part it is warmer and softer, in high-mountainous – severe, but a climate of the Arhyzsky hollow and the wide valleys adjoining to it, more favorable. The hollow is protected from different directions by high ridges and consequently here slightly overcast, biggest quantity of sunny days, air dry and windless. Arhyaz it a place where in months of flowering of the grasses causing an allergy, people feel perfectly and breathe crystal-clear intoxicating mountain air. 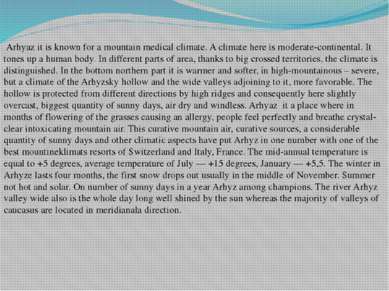 This curative mountain air, curative sources, a considerable quantity of sunny days and other climatic aspects have put Arhyz in one number with one of the best mountineklimats resorts of Switzerland and Italy, France. The mid-annual temperature is equal to +5 degrees, average temperature of July — +15 degrees, January — +5,5. The winter in Arhyze lasts four months, the first snow drops out usually in the middle of November. Summer not hot and solar. 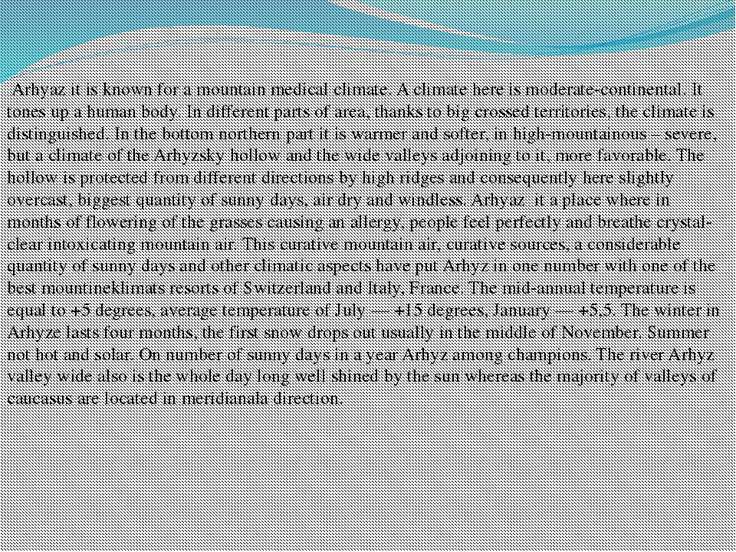 On number of sunny days in a year Arhyz among champions. 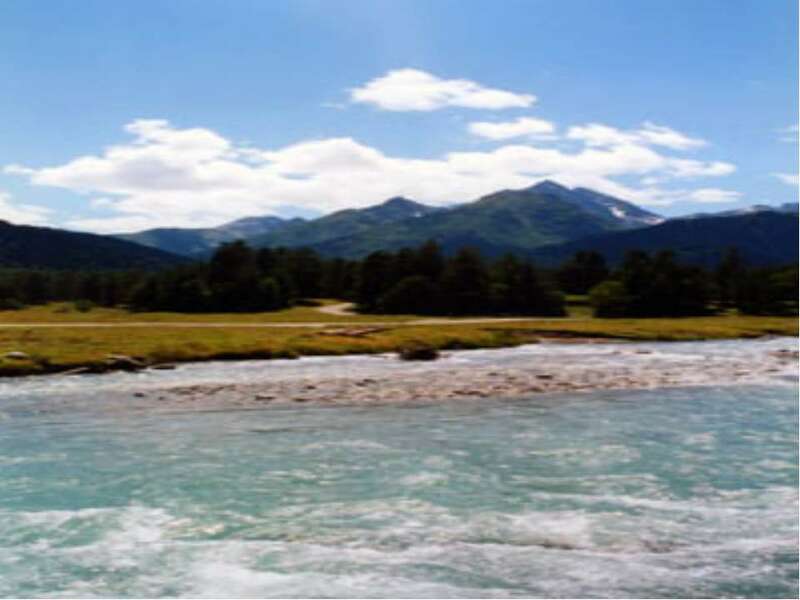 The river Arhyz valley wide also is the whole day long well shined by the sun whereas the majority of valleys of caucasus are located in meridianala direction. 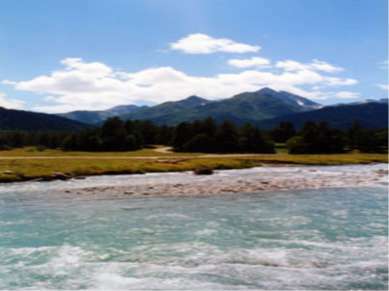 It is extremely rich and various animal and flora of Arhyza, therefore in 1957 a part of this area - a river Kizgich valley, has been included in structure of Teberdinsky state reserve. 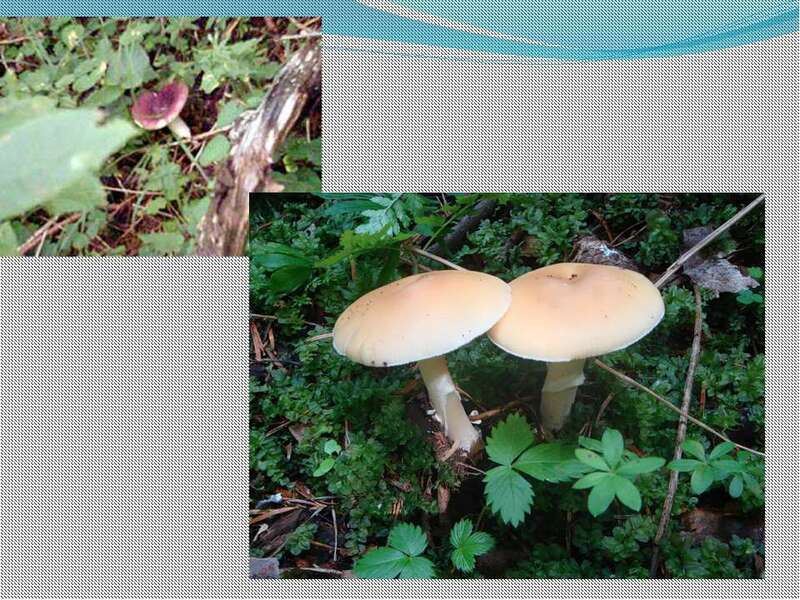 Slopes of valleys are covered by virgin forests, and for each slope the special type of vegetation is characteristic. A nature sanctuary is also beechen wood of Arhyza (about it the special tablet says). It is a rare site at such heights (23 hectares) mighty old trees 200-220 age. 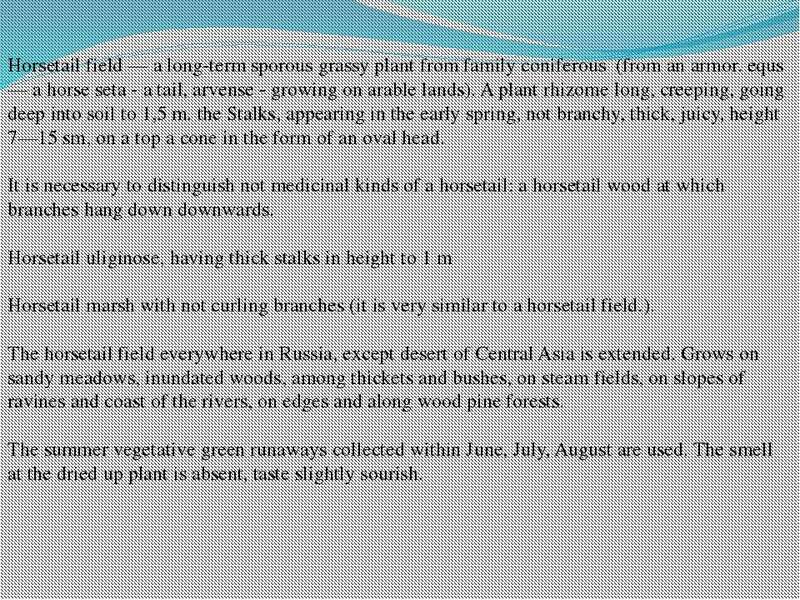 Their height reaches 25-28 m and a grasp of trunks in 3-3,5 m. In a valley live: the Caucasian deer, a bear, the roe, round, a chamois, a bison, a wild boar, a wolf, a lynx, a fox, a hare, a wild cat, the squirrel, etc. Here is more than 120 kinds of birds among which the great interest is represented by rare species: a black signature stamp, white-headed sip, a golden eagle, the bearded man-jagnjatnik. 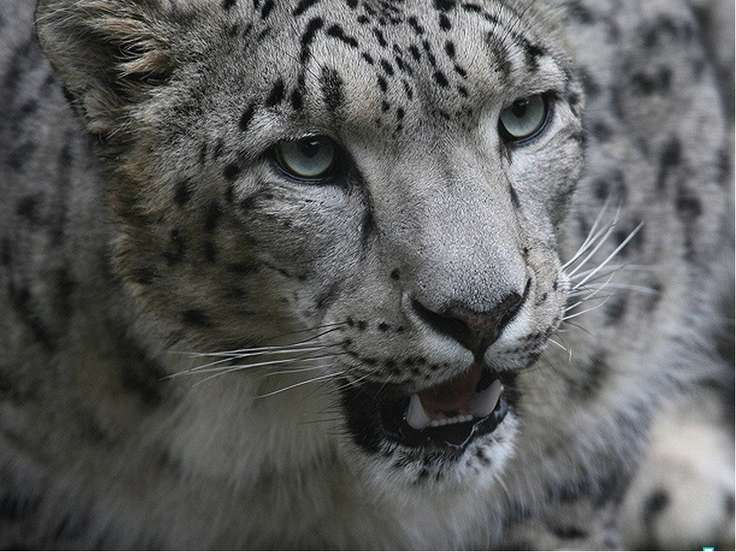 The hero of many ancient and modern legends of Karachaja is the snow leopard, a leopard as it names scientists. What does he look like? The body harmonous and flexible, with strong feet, height in shoulders of 50-75 sm, weight fluctuates within 23-60 kg more often. Ears short, rounded off, without brushes. Fur not long, but dense, coloring spotty. Leopards live in deaf mountain woods at height of 1500-3500 m above sea level, a den arrange in clefts of rocks, caves. Eat wild hoofed animals, concealing them or trapping in an ambush. Hunt at night, showing thus exclusive dexterity and force, perfectly swarm up rocks and trees. It is said that the leopard can finish with a small bear. To capture a sight all Arhyz, it is necessary to rise on "outlook" of a ridge of Abishira-Ahuba (the highest point 3173м) which goes to In parallel main Caucasian ridge and is southern border of a valley (the highest points of mountain Pshish 3790м, Amanauz 3530м, Alan 3443м). From the east and the West Arhyzsky surround perpendicular spurs of the Main Caucasian ridge of Arkasara (the mountain Zakan-Syrt highest points 3097м, with Dukka 2208м) and Uzhum (the highest points of mountain the Mortuary-syrty 3141м, Red 2777м). Upper courses of the rivers Psysh and Kyzgych are divided by the rocky buttress departing to the north from the Main ridge which soon branches on ridges Sofia (the highest point mountain Sofia 3637м) and Tcheget-chat. 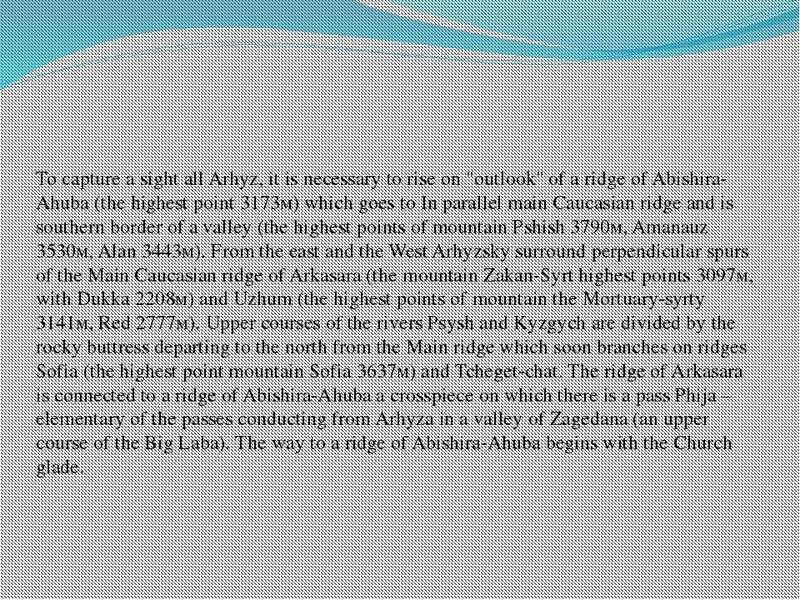 The ridge of Arkasara is connected to a ridge of Abishira-Ahuba a crosspiece on which there is a pass Phija – elementary of the passes conducting from Arhyza in a valley of Zagedana (an upper course of the Big Laba). The way to a ridge of Abishira-Ahuba begins with the Church glade. 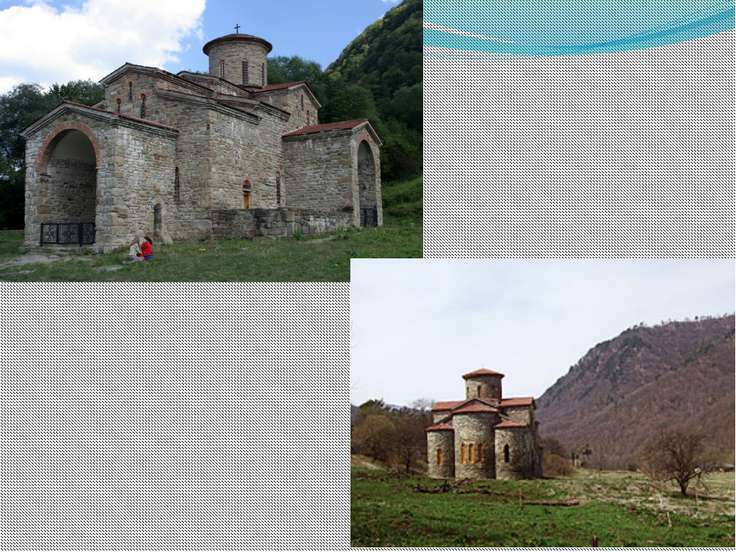 It has received the name because of the ruins of small church of X century found here, in the end of XIX century it was sketched by the artist and archeologist D.M.Strukov. Round church the stone fence has been combined, nearby there was a cemetery. Stone boxes-tombs were covered with massive plates. Now from church there was only a heap of stones yes the run wild pears there is no time a huge garden. As the first exhibit of a museum open-air which is represented by the Church glade, the huge stone on a roadside serves. On it has remained cut in X in alanami a Christian cross. 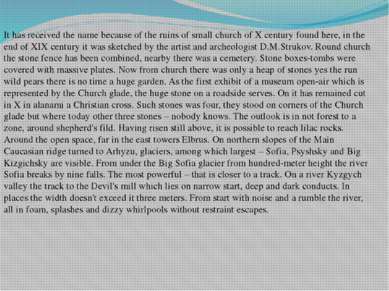 Such stones was four, they stood on corners of the Church glade but where today other three stones – nobody knows. The outlook is in not forest to a zone, around shepherd's fild. Having risen still above, it is possible to reach lilac rocks. Around the open space, far in the east towers Elbrus. On northern slopes of the Main Caucasian ridge turned to Arhyzu, glaciers, among which largest – Sofia, Psyshsky and Big Kizgichsky are visible. From under the Big Sofia glacier from hundred-meter height the river Sofia breaks by nine falls. The most powerful – that is closer to a track. 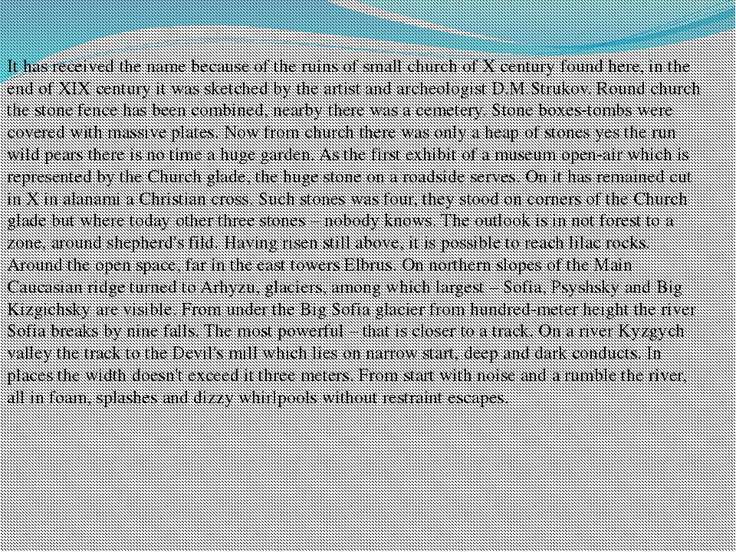 On a river Kyzgych valley the track to the Devil's mill which lies on narrow start, deep and dark conducts. In places the width doesn't exceed it three meters. From start with noise and a rumble the river, all in foam, splashes and dizzy whirlpools without restraint escapes. 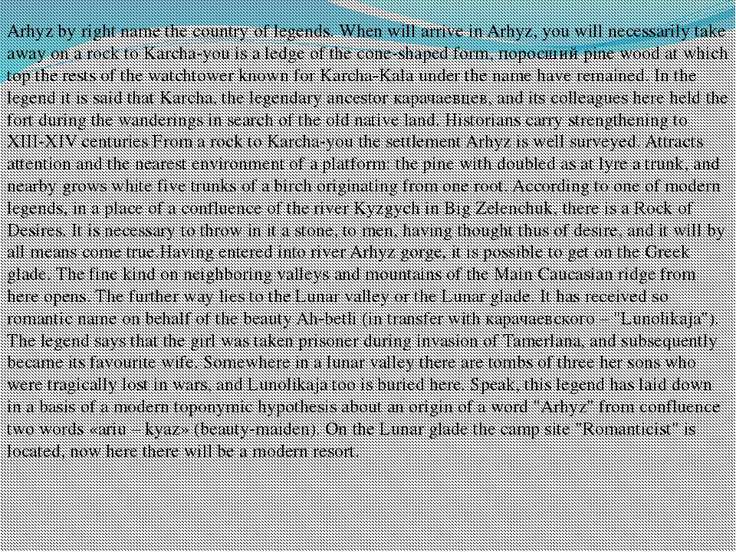 Arhyz by right name the country of legends. When will arrive in Arhyz, you will necessarily take away on a rock to Karcha-you is a ledge of the cone-shaped form, поросший pine wood at which top the rests of the watchtower known for Karcha-Kala under the name have remained. 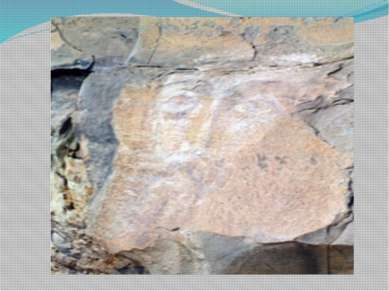 In the legend it is said that Karcha, the legendary ancestor карачаевцев, and its colleagues here held the fort during the wanderings in search of the old native land. 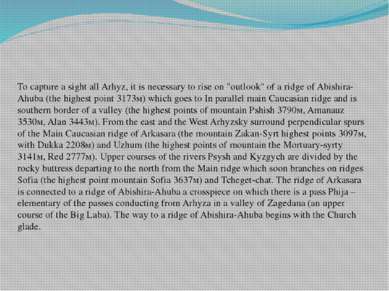 Historians carry strengthening to XIII-XIV centuries From a rock to Karcha-you the settlement Arhyz is well surveyed. Attracts attention and the nearest environment of a platform: the pine with doubled as at lyre a trunk, and nearby grows white five trunks of a birch originating from one root. According to one of modern legends, in a place of a confluence of the river Kyzgych in Big Zelenchuk, there is a Rock of Desires. It is necessary to throw in it a stone, to men, having thought thus of desire, and it will by all means come true.Having entered into river Arhyz gorge, it is possible to get on the Greek glade. The fine kind on neighboring valleys and mountains of the Main Caucasian ridge from here opens. The further way lies to the Lunar valley or the Lunar glade. It has received so romantic name on behalf of the beauty Ah-betli (in transfer with карачаевского – "Lunolikaja"). The legend says that the girl was taken prisoner during invasion of Tamerlana, and subsequently became its favourite wife. Somewhere in a lunar valley there are tombs of three her sons who were tragically lost in wars, and Lunolikaja too is buried here. Speak, this legend has laid down in a basis of a modern toponymic hypothesis about an origin of a word "Arhyz" from confluence two words «ariu – kyaz» (beauty-maiden). 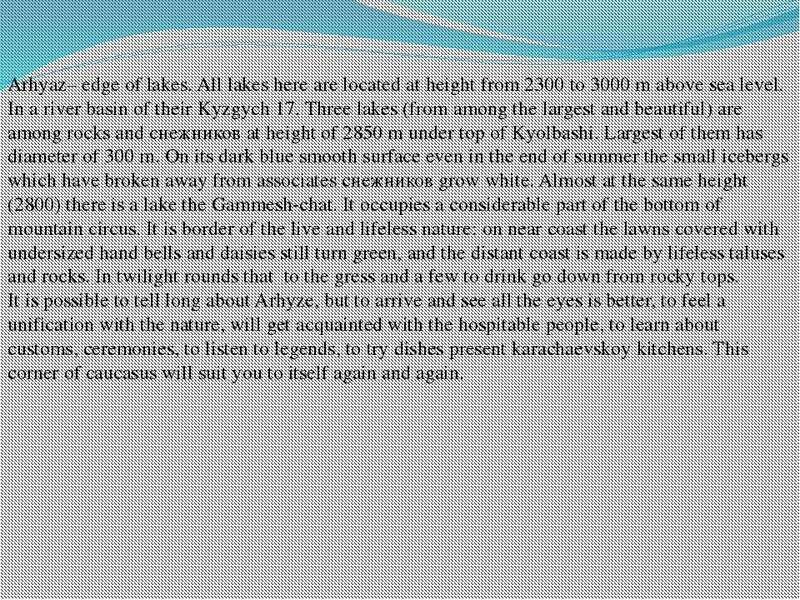 On the Lunar glade the camp site "Romanticist" is located, now here there will be a modern resort. Arhyaz– edge of lakes. 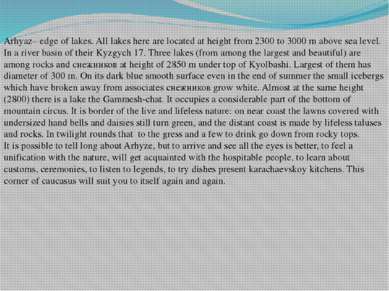 All lakes here are located at height from 2300 to 3000 m above sea level. 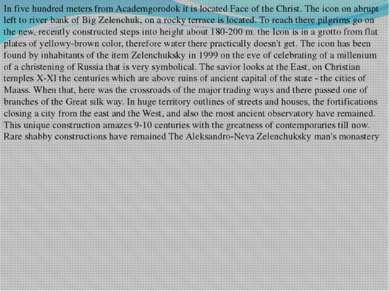 In a river basin of their Kyzgych 17. Three lakes (from among the largest and beautiful) are among rocks and снежников at height of 2850 m under top of Kyolbashi. Largest of them has diameter of 300 m. On its dark blue smooth surface even in the end of summer the small icebergs which have broken away from associates снежников grow white. Almost at the same height (2800) there is a lake the Gammesh-chat. It occupies a considerable part of the bottom of mountain circus. It is border of the live and lifeless nature: on near coast the lawns covered with undersized hand bells and daisies still turn green, and the distant coast is made by lifeless taluses and rocks. In twilight rounds that to the gress and a few to drink go down from rocky tops. It is possible to tell long about Arhyze, but to arrive and see all the eyes is better, to feel a unification with the nature, will get acquainted with the hospitable people, to learn about customs, ceremonies, to listen to legends, to try dishes present karachaevskoy kitchens. This corner of caucasus will suit you to itself again and again. 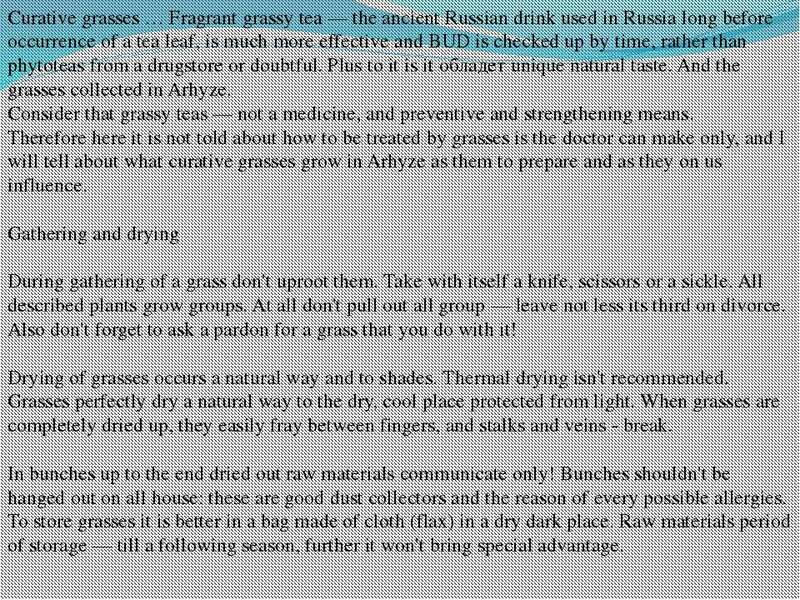 Curative grasses … Fragrant grassy tea — the ancient Russian drink used in Russia long before occurrence of a tea leaf, is much more effective and BUD is checked up by time, rather than phytoteas from a drugstore or doubtful. Plus to it is it обладет unique natural taste. 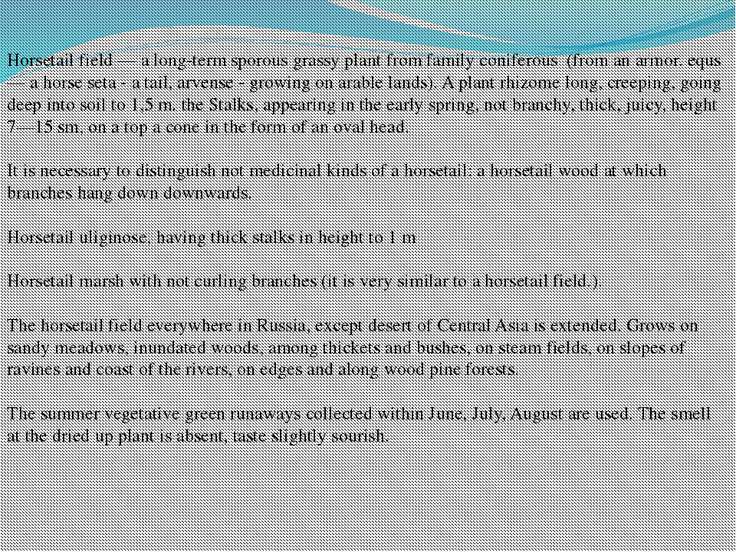 And the grasses collected in Arhyze. 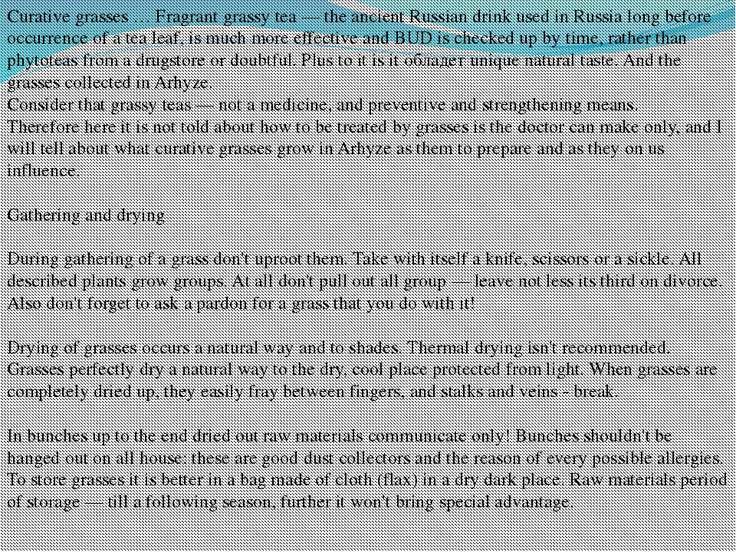 Consider that grassy teas — not a medicine, and preventive and strengthening means. Therefore here it is not told about how to be treated by grasses is the doctor can make only, and I will tell about what curative grasses grow in Arhyze as them to prepare and as they on us influence. Gathering and drying During gathering of a grass don't uproot them. Take with itself a knife, scissors or a sickle. All described plants grow groups. At all don't pull out all group — leave not less its third on divorce. Also don't forget to ask a pardon for a grass that you do with it! 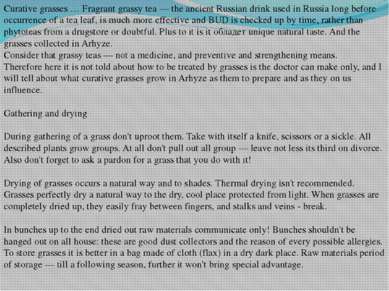 Drying of grasses occurs a natural way and to shades. Thermal drying isn't recommended. Grasses perfectly dry a natural way to the dry, cool place protected from light. When grasses are completely dried up, they easily fray between fingers, and stalks and veins - break. In bunches up to the end dried out raw materials communicate only! Bunches shouldn't be hanged out on all house: these are good dust collectors and the reason of every possible allergies. To store grasses it is better in a bag made of cloth (flax) in a dry dark place. Raw materials period of storage — till a following season, further it won't bring special advantage. Horsetail field — a long-term sporous grassy plant from family coniferous (from an armor. equs — a horse seta - a tail, arvense - growing on arable lands). A plant rhizome long, creeping, going deep into soil to 1,5 m. the Stalks, appearing in the early spring, not branchy, thick, juicy, height 7—15 sm, on a top a cone in the form of an oval head. It is necessary to distinguish not medicinal kinds of a horsetail: a horsetail wood at which branches hang down downwards. 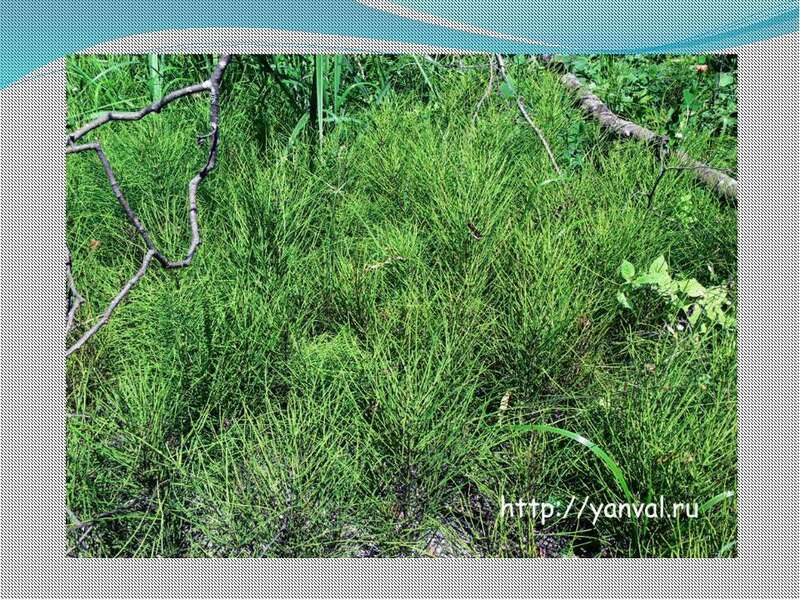 Horsetail uliginose, having thick stalks in height to 1 m Horsetail marsh with not curling branches (it is very similar to a horsetail field.). 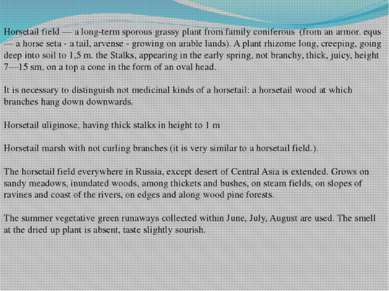 The horsetail field everywhere in Russia, except desert of Central Asia is extended. Grows on sandy meadows, inundated woods, among thickets and bushes, on steam fields, on slopes of ravines and coast of the rivers, on edges and along wood pine forests. The summer vegetative green runaways collected within June, July, August are used. The smell at the dried up plant is absent, taste slightly sourish. 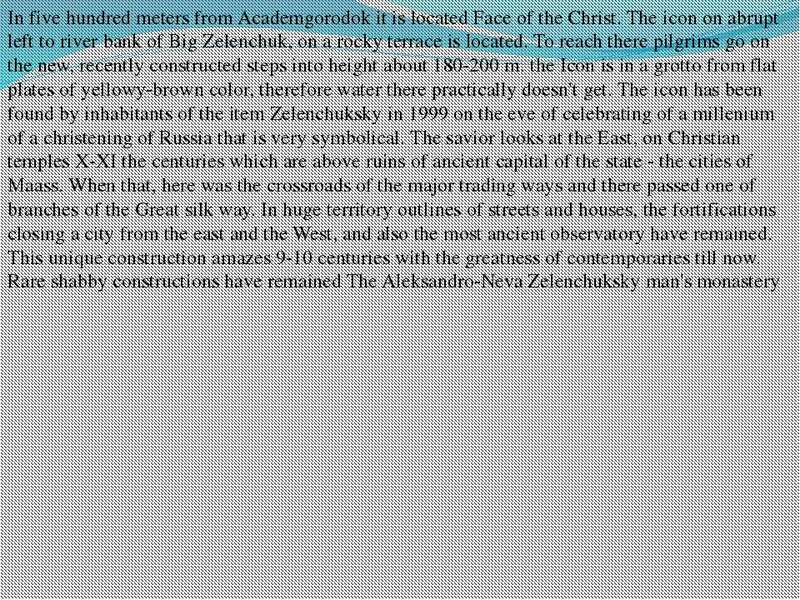 THE WESTERN EUROPEAN AND THE NORTH AMERICAN NEW TIMES ARCHITECTURE / The history of Architecture from Prehistoric to Modern times: The Album-15 / by Dr. Konstantin I.Samoilov. – Almaty, 2017. – 19 p.